The recipe only calls for SIX ingredients, although a few of them are repeated in different layers, and all of them are ingredients you don’t need to feel guilty about putting in your body. 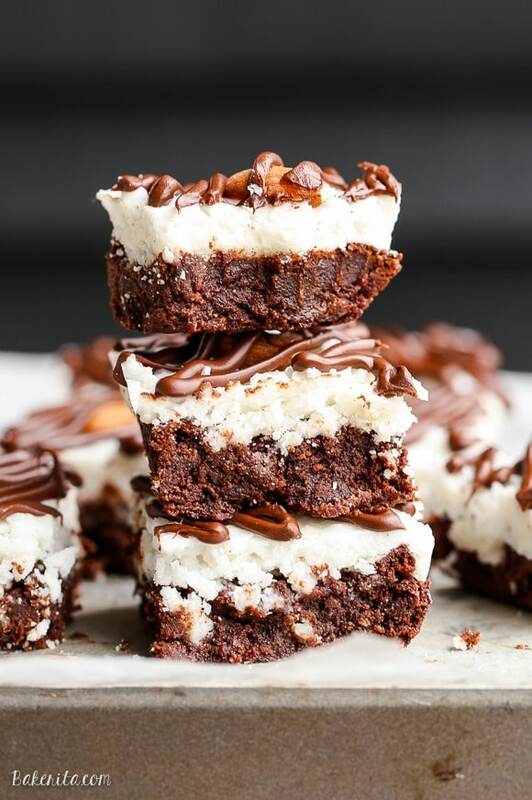 Because they’re gluten-free, grain-free, Paleo, refined-sugar-free, and vegan, you can serve them to just about anyone…just make sure to save some for yourself! Preheat the oven to 350ºF. Grease a 14x5” tart pan or 8x8” square pan with coconut oil (I recommend lining the pan with parchment paper as well if your pan doesn't have a removable bottom). Put coconut flour in a bowl. Add the maple syrup and stir until fully combined and crumbly. Add the room temperature coconut oil and mix until a large dough ball forms, pressing out any clumps of coconut oil. I used my hands at the end to bring the dough fully together. For the chocolate topping, whisk together all of the ingredients and pour over the cooled caramel layer. Smooth evenly and sprinkle with flaky sea salt. Let cool until set. Slice into 1-inch slices, or 16 squares. Keep stored in the refrigerator. Can I get an AMEN for this recipe? Twix is my all time favorite candy bar! And you made it healthy and grain-free, which makes me cry tears of happiness! YOU ROCK! This is awesome! I love twix and this healthier version is amazing. Love how you cut them into little batons…I just want to pick one up and devour it! Whoa! These are vegan? I never would have believed it. These look delicious and I totally deserve some chocolate rewards! Aw thanks Karrie! I agree – I’m so not a fan of all the sugar in them. Hope you try these!! 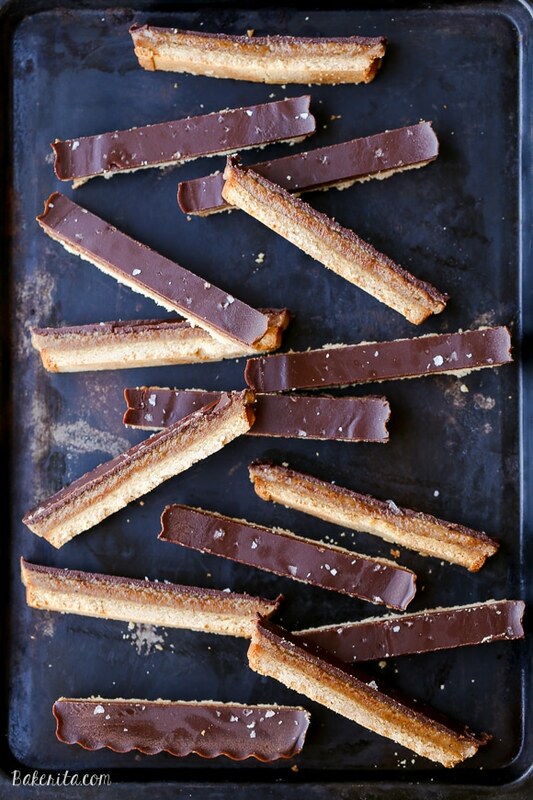 Love these healthier twix bars- I love myself a decadent dessert or two, but I really can’t deal with the artificial stuff :) Pinning! You made my day! I can’t believe these are guilt free. I love Twix, I hate to admit it but at Halloween I kept stealing these out of my daughters candy bag. I love that little bit of crunch with the caramel and chocolate. Pinned! Take care. Aren’t they the best?! So irresistible :D thanks, Stacey! I feel like I’ve been waiting for these bars my whole life! Honestly, who would want an actual Twix when you could just have one of these instead? Such a fabulous recipe, as always, Rachel. That’s it. Just ignore me while I fill my face with these homemade Twix bars. AMAZING! And they are lovely! These look delicious! Thanks for sharing a great recipe. Hi Rachel, Question: Can I use melted GF, Dairy free chocolate chips for the topping? Thanks! looks AMAZING!! definitely plan on making these soon..but what do you think about baking just the shortbread base into cookies? would that work? Hi Bianca. You mean like scoop them into balls and bake them that way? I actually have no idea how that would turn out…I’ve only used this dough as a base for bars. Let me know how it turns out if you try it! 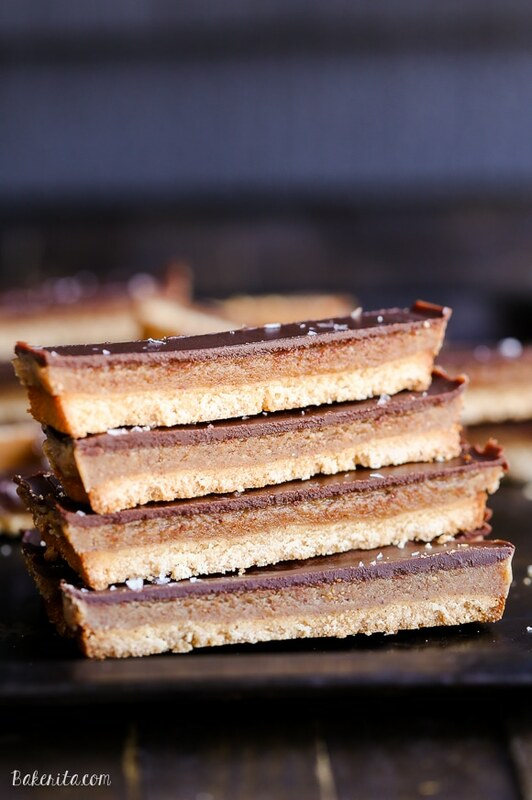 Healthy Twix bars sounds like something I definitely need to have in my life soon! Those look fantastic! Rachel, these are amazing, I can’t wait to try them. What can be used instead of almond butter? I’m allergic to nuts But desperately want to try this!! Hi Chantelle. I would try substituting sunflower seed butter! Enjoy. Hi Rachel, these look amazing. really want to make them for my daughter who has masses of allergies. is there anything I could substitute for the almond butter which is neither a nut butter or sunflower seed butter since she is allergic to sunflower too? Hmm, can she have tahini? I haven’t tried it here, but it should work well in place of the nut butters, as long as she likes the taste of it. You could also make a simple date caramel for the filling instead of the nut butter version! Hope this helps, Natasha. Let me know if you have any other questions! This is a great treat!! I am going to introduce them to my Mom who is diebetic. With them being refined sugar free she can enjoy a sweet treat. They taste great! Do you have any other treats that are gluten free, refined sugar free, paleo and vegan? Hi Jason – thanks, so glad you like them! I do have quite a few – you can browse through the Paleo archives on my site and the ones that are also vegan will be marked as such. Hope this helps! Hello. These look great. But do they taste coconuty from all the coconut oil? Hi Meemz. If you use refined coconut oil, the taste has been neutralized and you won’t get any coconut taste. My roommate hates coconut and loved these! Hope this helps. These are insane! I actually printed the recipe… I think I’m gonna make them! Seriously impressed. Thank you so much – I hope you love them, Meggan! I made these over the weekend and they are delicious! Thank you so much!! They were a hit at my office today, although many coworkers thought they seemed more like a Girl Scout Samoa bar instead of a twix bar. Hi Michelle – if the coconut oil you used is unrefined and has a coconutty flavor, I can totally see where they would get a “Samoa” flavor. I used refined oil, so it didn’t taste coconutty. Glad they were a hit! These were way too good! Made them last night and decided to use special dark cocoa for the chocolate… I am dying of pure happiness. Can’t believe how perfect the caramel was either. Thank you SO SO SO SO SO SO much for this recipe. How are these heathy? Each tiny slice as 200 calories. 18 grams of fat with 11 being saturated. There’s still 8 grams of sugar per bar. Hi Kelley. Like any dessert, these should be enjoyed in moderation and they are meant to be a better-for-you alternative than a traditional Twix bar. Looks awesome! However, maple syrup is sugar…. if you wanted to truly make this sugar free, erythritol, xylitol or stevia would work. Hi Caren. You are correct – these bars are refined sugar free, but of course maple syrup is still sugar, just an unrefined version. I’m not sure how any of them would work in this recipe since I haven’t tried it. Be careful with sugar substitutes like those. They are bad for your adrenals. Your tongue tastes something sweet and then your adrenals start their productions to process sugar that the body doesn’t get, therefore shocking and straining them. Best avoid sweet things altogether if its in alignment with your health goals, there are no shortcuts…but boy is it worth it. I’m so glad you liked them, Jessica! Definitely! The honey flavor will likely come through a bit more, but it will still be delicious. Enjoy! Yes, they’re actually great frozen and defrost wonderfully :) Enjoy!! Could I substitute almond flour for the coconut flour? I don’t have coconut but I have a lot of almond that I need to use!! Hi Riley. Coconut flour is it’s own beast entirely, and has a much higher absorption rate than almond flour, so unfortunately no, the recipe just wouldn’t work right if you substituted one for the other. 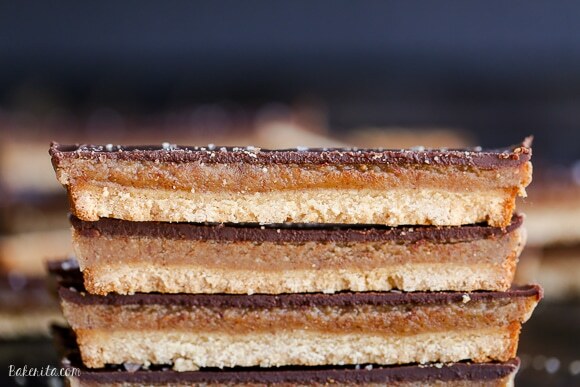 The only way to get the right crust texture for these bars is using coconut flour. Sorry! Just made these – super good!! Will definitely make again when we have guests. We just made these yesterday, and they were delicious! We subbed peanut butter for the almond, because my husband can’t eat almonds. We ran out of maple syrup halfway through, and used honey. Even with our substitutions, they turned out well. With the peanut butter, they tasted like peanut butter cups, only much better. My one recommendation is to line your pan with parchment paper if you aren’t using a tart pan. They are a challenge to get out of the pan, and I oiled it well. Thank you for the great recipe. Hi Beth – thanks for coming to share your feedback! So glad you enjoyed the recipe, even after making some substitutions. It sounds delicious with peanut butter! Thank you for the parchment paper recommendation – I’m sure future readers will appreciate the tip. Have a good weekend! on a crumble scale of 1-10 .. How crumbly should the crust be after baking? After baking, the crust should hold together well – I lifted it out of the pan in one piece. If it’s much more crumbly than that, too much coconut flour was probably used! Hi I made these tonight, following the recipe exactly. They came out pretty good. They didn’t really taste like Twix candy but that’s okay – we still liked it. Even though I oiled the pan, the cookie part stuck to it making it hard to cut into bars. Also, there didn’t seem to be enough chocolate topping. The layer was very thinly spread. I think I will double the recipe next time and use parchment paper in the pan. Hi Elle, thanks for your feedback! I added a note to the recipe to line the pan with parchment paper to help make them easier to remove. I just made these and OMG, they are incredible!! Soooo tasty and I was surprised at how much the texture actually did resemble a Twix bar! I used crunchy almond butter instead of creamy and I like the additional crunch of the almonds in the carmel layer, but that’s just me. The flavor of this version just blows away that processed garbage!! Rachel I have made at least 10 recipes from your website and I get rave reviews every single time, mostly from people who claim to not like ‘healthy’ desserts. :) I had to thank you again and to let others know, this is super easy to make and even if it wasn’t, it would be SO worth it! This makes me so happy to hear, TS!! Thanks so much for your sweet words – I’m so happy my recipes have become a favorite of yours, and I appreciate you sharing that with me :) hope you have a good weekend! Tried this last night, very excited if I can get it to work. I used peanut butter and that worked well and the biscuit base worked well. The chocolate topping? Disaster! Cocoa powder is a very strong flavour and this recipe has a lot in it. It was extremely bitter and had a salt flavour (instructions said to whisk all the ingredients together). It also didn’t set looking like chocolate like the photos. It felt like too much cocoa powder? Hi Nicola – I’ve made that chocolate recipe a number of times and it’s always worked perfectly for me. Is it possible you packed the cocoa powder too much while measuring? I’m not sure what could have gone wrong besides that. Hi Seana – unfortunately, coconut flour has very unique, super absorbent properties and no other flour will substitute well. Sorry! Ian very looking forward to trying your vegan twix recipe. I was wondering if I could substitute agave nectar for the maple syrup? Hi Rikki. I don’t use agave nectar, but it should substitute just fine for the maple syrup. Enjoy! The Raw Agave Nectar worked great! Thank you! Hi! I was very excited to make these! But when it came time for the choc topping, it was a complete fail! I did it twice in fact and both times it came out clumpy, and not smooth. Seemed like there was too much oil. Any suggestions? I’m just going to use chocolate chips because I used all my coco powder now. A little disappointed! Hi Kailey. If it came out clumpy, I’ll bet it was due to the cocoa powder not incorporating into the oil well, which would also explain the excess oil. Sifting the cocoa powder should do the trick to get rid of the clumps and help it incorporate. Melted chocolate will also work. Sorry for your troubles – hope you still love the bars! Hello! I just wanted to tell you my family and I really enjoyed these bars! I made a few tweaks. I used butter instead of coconut oil in the crust. Also I used only 1 Tbsp maple syrup in the crust, plus some water to help it come together. In the carmel, I used a little less coconut oil because I was afraid of there would be a strong coconut flavor. For the chocolate, I just melted some of my favorite chocolate bar and spread it on top. They were delicious! I haven’t look around very much on your website, but now I think I will! Thank you so much. These are delicious!! I didn’t wait for them to set 100% since it’s late a night and I HAD to try some before bed ;) But I love this recipe! Hahah I know how that is! ;) Thanks so much, Gina. Glad you loved them! I am flabbergasted at how amazing this recipe is! I would go as far as even calling it better than the original. I love that with this recipe you know exactly what is going into your body, not to mention it is totally delicious! Thank you so much for this lovely recipe! Your comment makes me so happy, Jamila! I’m so happy you loved the Twix Bars so much. Thanks for sharing your experience with me! 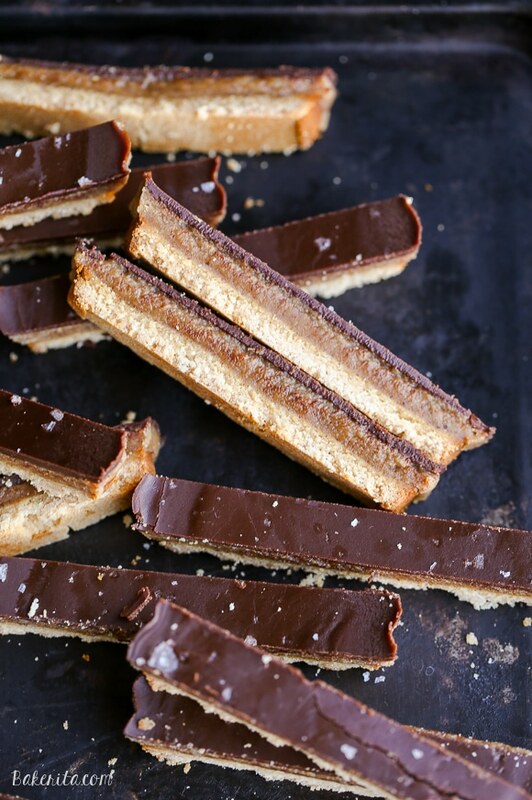 Amazing twix bars! My family absolutely loved them!! Holy Guacamole these are freakin amazing! Do you know the nutritional facts per bar? I’m curious about the carbs per bar and that fat. This going to be a perfect treat for the weekend! Glad you enjoyed them, Nicoal! Just add a pinch of salt to start and then add to taste to make sure it’s the right level for you next time :) enjoy! So happy to hear they were a hit, Carmela! Hi Megan – I’ve never used rice malt syrup so I can’t say whether it would be a good replacement. You will taste it, so as long as you enjoy the flavor I assume it would work fine, can’t make any guarantees though! Yes! 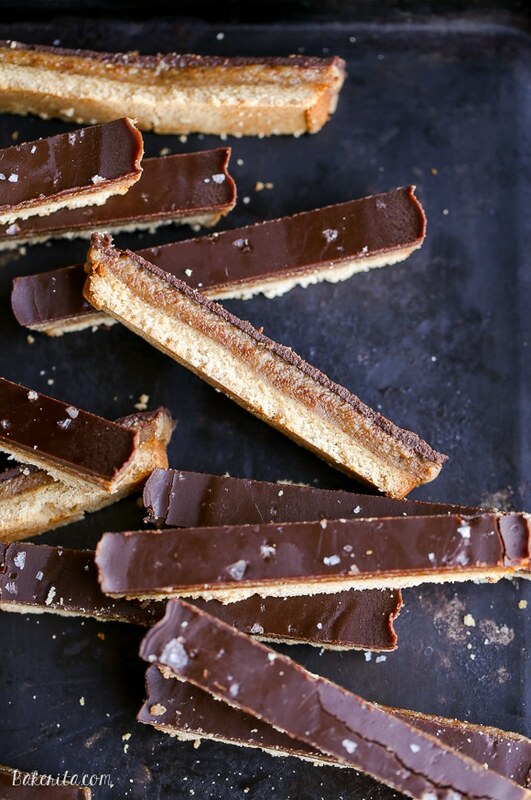 This recipe for homemade Twix Bars is a game changer! They look delicious! Can’t wait to try all of them! Cheers!! Thanks so much, Sam! Hope you love them. Oh goodness, your recipe is so amazing! no kidding. i made these bars—delicious! So glad you enjoyed them, Celeste! Thanks for your feedback. Hi Amy – how odd! I’ve made this recipe SO many times and have never had that happen – was your nut butter really creamy when you started, or was it separating a bit into oil? If the nut butter was too oily and wasn’t super creamy, that could be the cause. Id’ try pouring off the excess oil and seeing if that helps – so sorry you’re having trouble! !!!! My family is going to be so happy you posted this! :D Seriously though.. that caramel layers looks like perfection! So glad to hear you enjoyed them Valerie!! Thanks for sharing your feedback. This was my first Bakerita recipe and I sure picked a winner! It came together easily and tastes amazing. I am looking forward to trying more of your recipes. Thanks! So glad you enjoyed them Cindy! Hey! If I wanted to send a few of these to some family in another state, would it be terrible if they weren’t in the fridge for a day? Thanks! Hi Noelle! My worry is that the center layer would get melty if it’s exposed to any heat…they might find a messy box. If you’re shipping from cold weather to cold weather though, they might survive the journey. I’d recommend wrapping them really well (maybe in foil to keep them insulated), shipping quickly, and maybe even throwing in an ice pack near them if you can. Hope this helps! 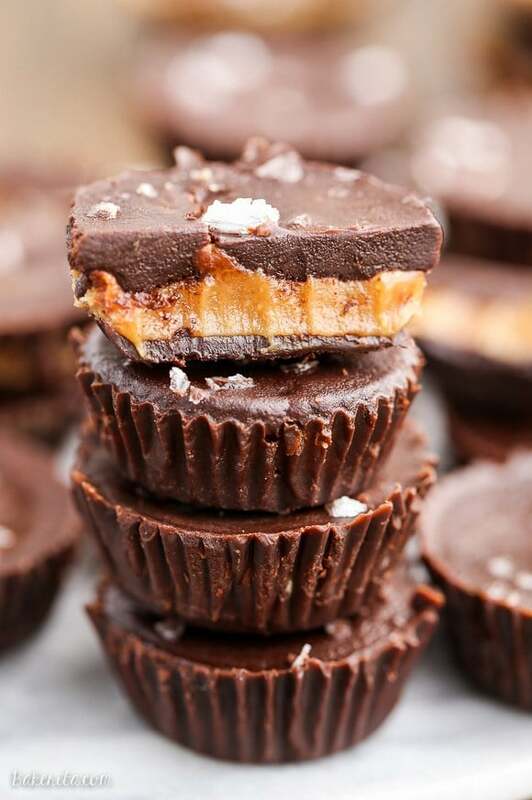 Has anyone tried a peanut butter Twix version of this recipe? I like PB Twix much better than caramel ones (I know I’m weird). Thx!! 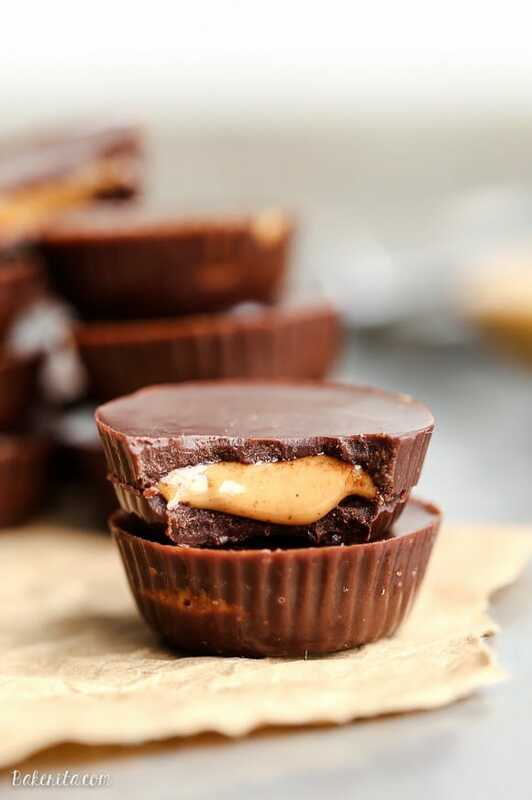 I’ve made them with peanut butter instead of almond butter in the filling – you definitely get a peanut butter taste! You could try that :) enjoy! Do I grease my pan with coconut oil first then add parchment paper or do I only use the parchment paper if I opt for that? I’d recommend greasing the parchment with a bit of coconut oil, just to make sure there’s no sticking! So happy to find this! I was interested in making a batch and sending them from NY to my boyfriend in Texas. Would you happen to know how well they go unrefrigerated? Also, perhaps how long before they may stale? Thank you! Hi Angeli – they definitely get softer at room temperature and I wouldn’t recommend sending them in hot weather. If you’re going to send, I’d recommend freezing them before hand, wrapping them tightly in a few layers of aluminum foil, and shipping them quickly. They should stay good for at least a few days! Hope this helps. These look great! My suggestions on substitute for the nut butter (allergy) while having them stay vegan? Hi Indira – I’d recommend using sunflower seed butter! Thank you, will definitely give that a go! These are SO DELICIOUS. Ahhh I really just want to eat the entire pan. Fabulous recipe; I was a little hesitant to make them because the ingredients are a bit on the expensive side (only an issue if the recipe turns out terribly) but totally, absolutely worth it. Thank so much for this recipe. I love this crust so much too Majda! I use it for everything :) I’m so glad your family is enjoying the Twix Bars. Tasty recipe, but for the last layer, I would increase the amount of chocolate layer made so that you have more spreading power. I felt there wasn’t QUITE enough to spread effectively (and this was me pouring in a zigzag formation over the surface, not just a blob in the middle to try to evenly distribute). The more I tried to spread it to cover the corners, the faster it cooled, so it set before I could get it over the entire surface! It wasn’t enough chocolate to distribute by turning the pan side to side as does work for some recipes. Just something to keep in mind before pouring! Unfortunately coconut flour performs uniquely, and it can’t be substituted with anything else. A little goes a long way, though. I’d recommend investing in a bag, it’s not too expensive! Hi! Could i use a maple and agave mix syrup instead of pure maple syrup? Sure, Erin – either will work! Enjoy. I tried making them, but for some reason, I have the hardest time mixing maple, melted coconut oil & cocoa together. It always turns into a greasy, gritty clump with separated oil. I’ve tried 3 times. What am I doing wrong? That’s so odd, Angele – I mix them all the time with no trouble. Sorry you’re having issues. Are you using pure maple syrup? Also, try sifting your cocoa powder to prevent clumps. So I figured it out! Always use a fork, not a whisk. I had been using a whisk and seriously every time the mixture would fail. The Twix bars are the yummiest thing I’ve eaten in a long time! – Make sure to use Dutch processed baking cocoa: it has been treated to remove the strong bitterness of natural raw cocoa. – I used a disposable non-stick 8″ x 8″ aluminum pan and had no problem removing for cutting. Thank you SO much for sharing this wonderful recipe with us all! So thrilled you enjoyed them Dee! Thanks for your feedback. my husband is allergic to coconut oil …is there any replacement? Hi Alex, the coconut oil is pretty necessary to help the bars set since it gets firm when cooled, but you could try using butter or ghee in the crust and filling, and use regular chocolate for the topping. Enjoy! These bars are absolutely amazing! I have made them several times over the past year since I first pinned and always get compliments! With my Colitis and food sensitivities finding dessert type foods is impossible! These make up for it!! Thanks! I’m so thrilled to hear that you’re loving them! Thanks so much for the feedback and kind words, Alicia. can these be made in cupcake liners for an individual option? Yes, you definitely could do that! Just bake the crust for a shorter amount of time. Hi Roxana, I’m not sure what you mean by the cocoa flour is not sticking, and the composition from the pan? If you could clarify I could try to help. Sorry you’re having trouble with the recipe and that you don’t like my site anymore because of it. You say to combine coconut flour and salt in a bowl (#2). You don’t put salt in the shortbread crust ingredients. What to do??? Hi Nancy, oops! I used to have a bit of salt in there but removed it from the recipe. I’ll fix it now! Can i use ground almonds or an alternative to coconut flour? I haven’t tested it that way. If you do, you’ll want to use about 2-3x the amount because coconut flour is so much more absorbent than almond flour is! Glad you enjoyed them, April!! Hi Racheli, were the coconut oil and maple syrup both melted/not cold when mixing? It shouldn’t be super thick…you can always add more melted coconut oil to thin it out, though! In the end, I froze the cake and then managed to apply the cream. So thrilled you’re loving them, Lillian!! Thanks for sharing your feedback. Molasses would probably be too strong, and not sure about jaggery. Honey would be your best bet for a maple syrup substitute! It looks awesome ! Yummy ! The Twix Bars are so easy and sooooo gooood. Thanks so much Laura – so glad you’re enjoying the bars! !